For the first time ever, this weekend I made it to the top 4 of a magic tournament. 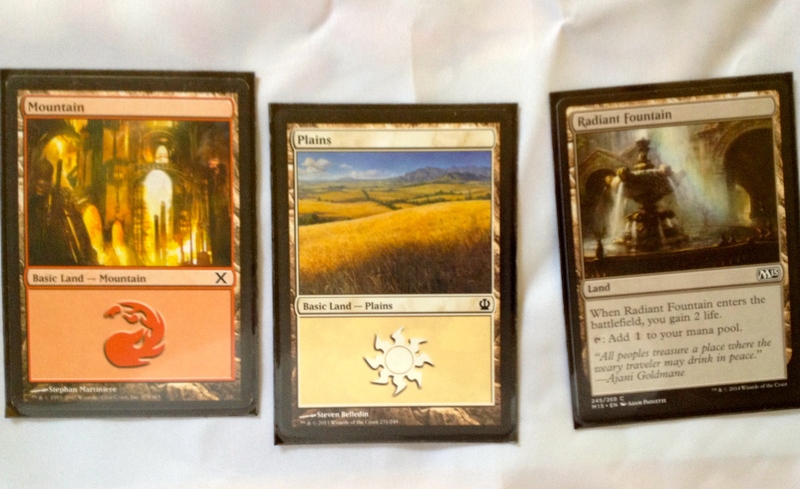 But this time was even more extra special…It was a sealed deck pre-release! This time was different, I believe, because I studied for the event well ahead of time. And I went into the event with a plan in mind. But it didn’t hurt that my cards worked really well together! Here are pics and commentary! I crafted this deck from my card pool. Green and Black were my star colors. I felt very comfortable playing these two colors together. I splashed a little red and white for added removal. These one drops really didn’t do that much. They became targets for Yisan, who I will be discussing shortly. 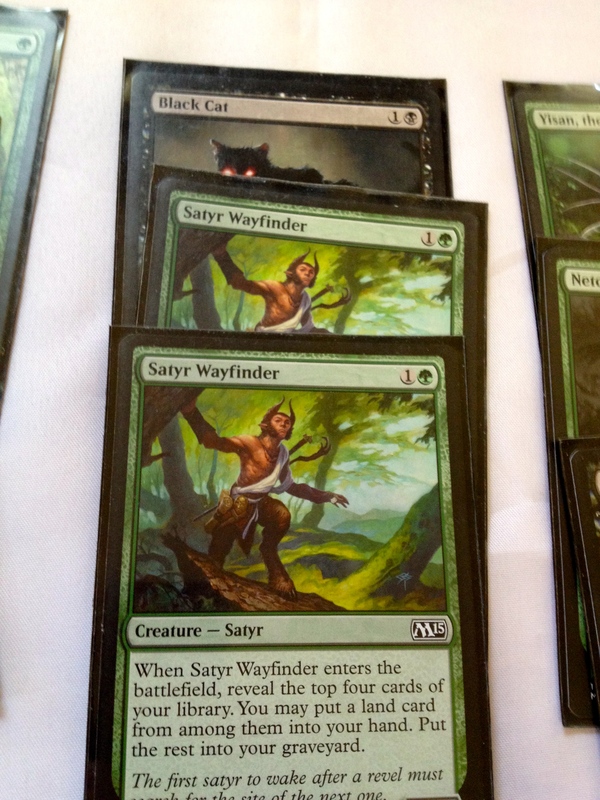 Satyr Wayfinder and Black Cat are old friends of mine. They accomplished their jobs well. The Satyr Wayfinder made sure there were things in my graveyard to use as resources. This was one of my goals. Now for the good stuff. Netcaster Spider was a star at blocking flyers. 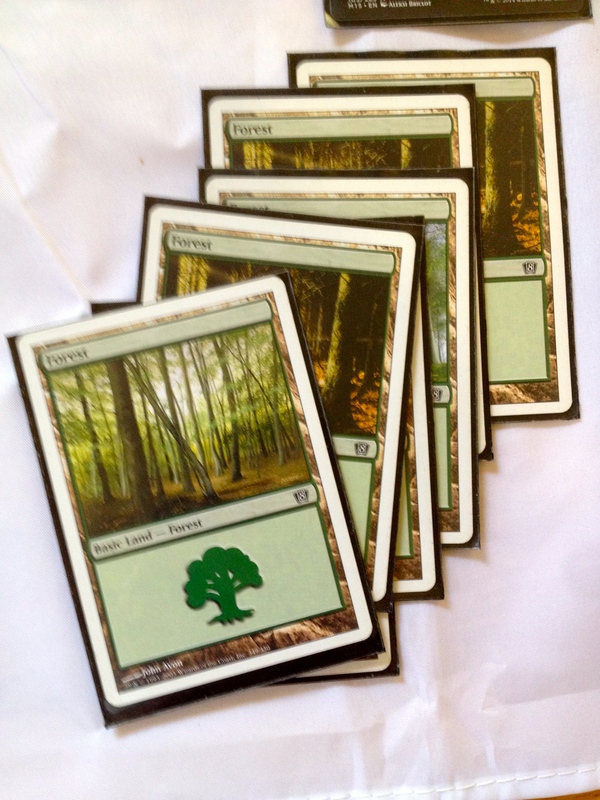 In limited formats, such as sealed deck, people choose flyers when they can. The Necrogen Scudder is an old friend. He hurts you when he enters the battlefield, though. And then there is Yisan. Yisan deserves his own paragraph. Yisan the Wanderer Bard is a music card. Right up my alley! Never once was he removed. I guess my opponents didn’t think him that big a threat. But guess what? Oh yes. He was the secret to winning most of my games. You pay his ability cost, onc green and two others, and then tap him. You get a “verse counter.” Then you get to find a creature from your deck with the Convereted Mana Cost of the number of verse counters he has on him. SICK! As mentioned already, the one drops were usually elvish mystics. The two drops, well they were the Satyr Wayfinders usually. The three drops were the only two possibilities. And the four drops were the next card I want to discuss. 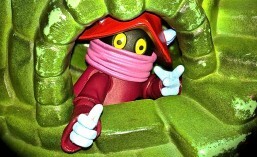 Undergrowth Scavenger. His power and toughness are equal to the number of creature cards in the graveyard. 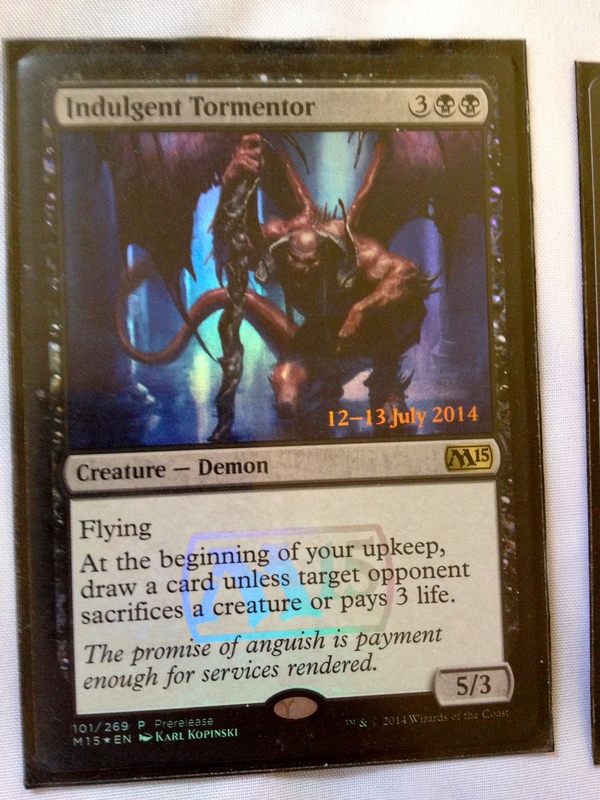 And I scored two of these guys in my sealed deck! He was almost always a 6 or 7 power and toughness and demanded an answer from my opponent, that they usually wouldn’t have. Once during the evening I got to ultimate Lilliana. My opponent just scooped right away! 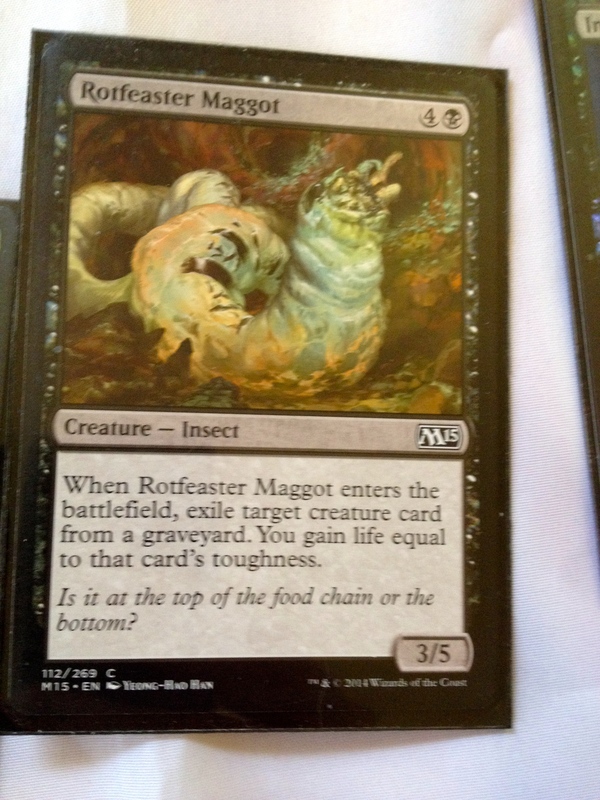 The Rotfeaster Maggot was included to help me recoup life loss from Necrogen Scudder and from a few other cards that had me paying life. Ah, the promo of the evening. If he wasn’t answered, GG. Usually my opponents wouldn’t sac someone or pay three life right away. But card advantage is one secret to winning in Magic. It didn’t usually take but two card draws and them being hammered a couple of times with him for them to pay the life. One more worthy mention. I actually got Soul of Innistrad. One of the cards I had my eye on since it was previewed. The Soul was a star if I ever got him out. at 6/6, he’s hard to kill. In the graveyard, he can get creatures into your hand from your graveyard. On the battlefield he can too. Only once was he removed. (Pillar of Light. A white exile spell with the condition that the toughness of the creature must be 4 or greater.) Exiling him is just about the only way to deal with him. Onto my removal. I passed up a few cards in my card pool. 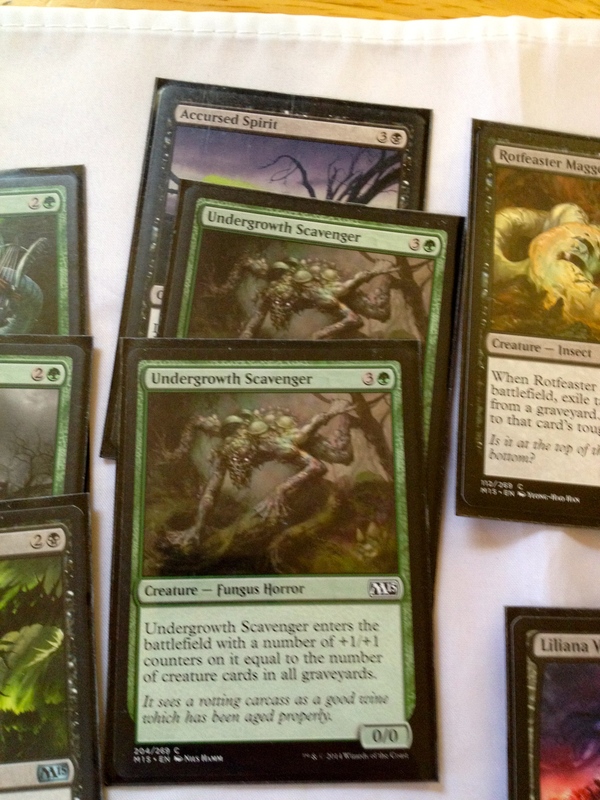 Festergloom and Crippling Blight, as well as Covenant of Blood. All black spells that should have worked. But I opted for the better options in other colors instead. This was a critical choice, especially with the splash of red. 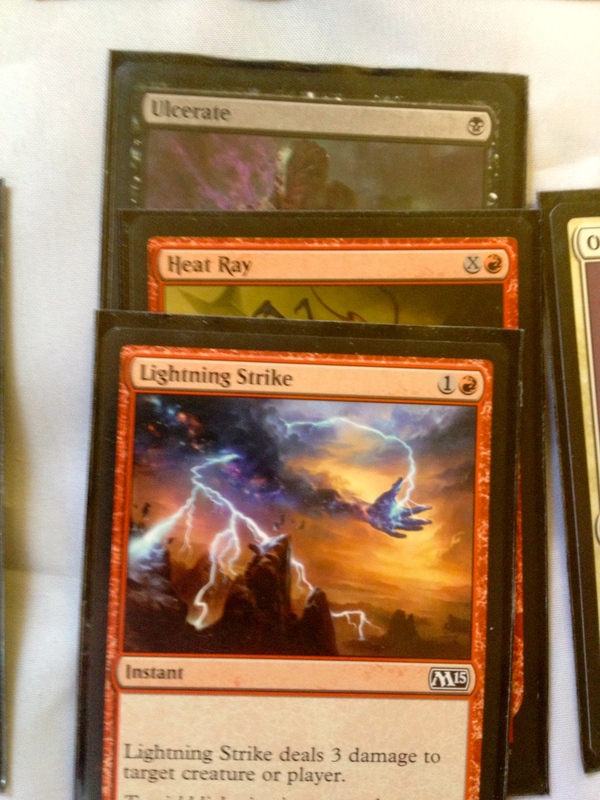 Heat Ray and Lightning Strike were just too good to pass up. 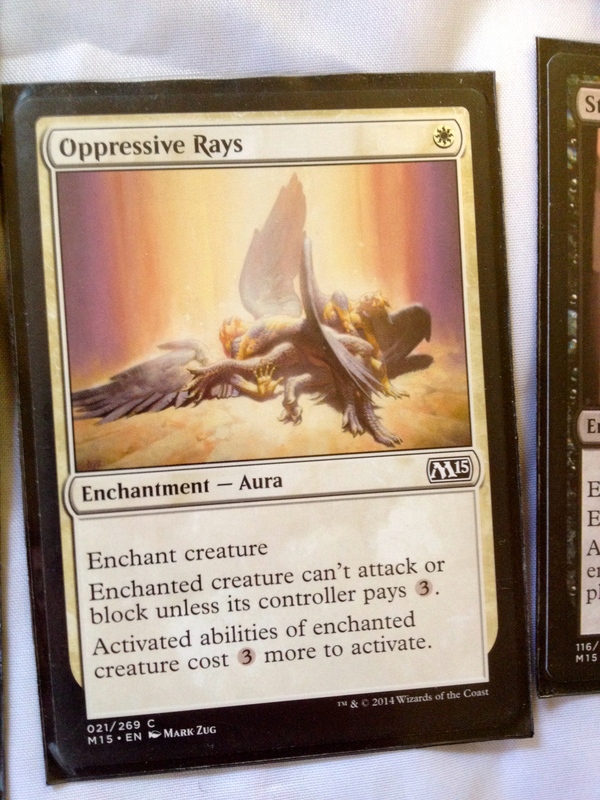 Oppressive Rays is a star in sealed deck limited. It rarely got used during this event, however. Ulcerate was one of those cards that penalized my life total. But it is so powerful at one drop. There were three other spells. I thoroughly enjoyed playing Necrobite. 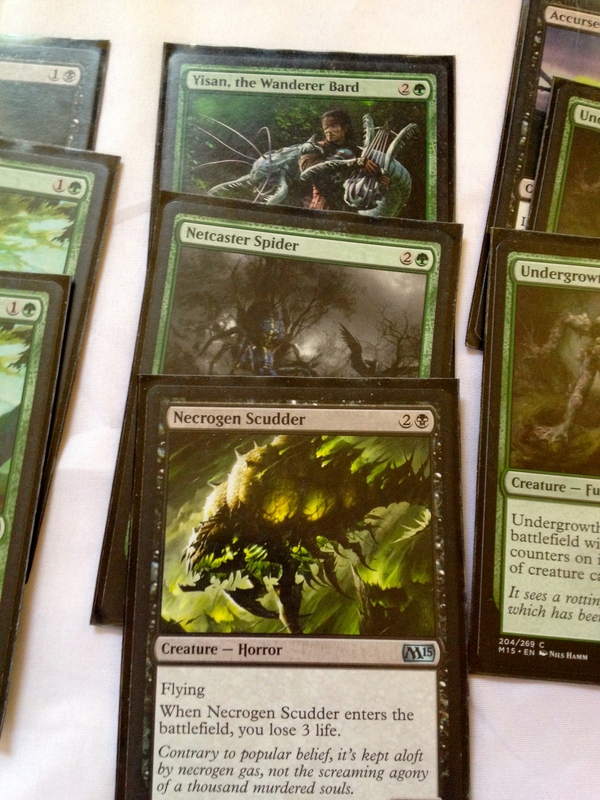 I would surprise my opponent…he would think he was trading creatures with me, then, BAM. I got one over on him. Stab Wound was cited as putting pressure on one opponent. 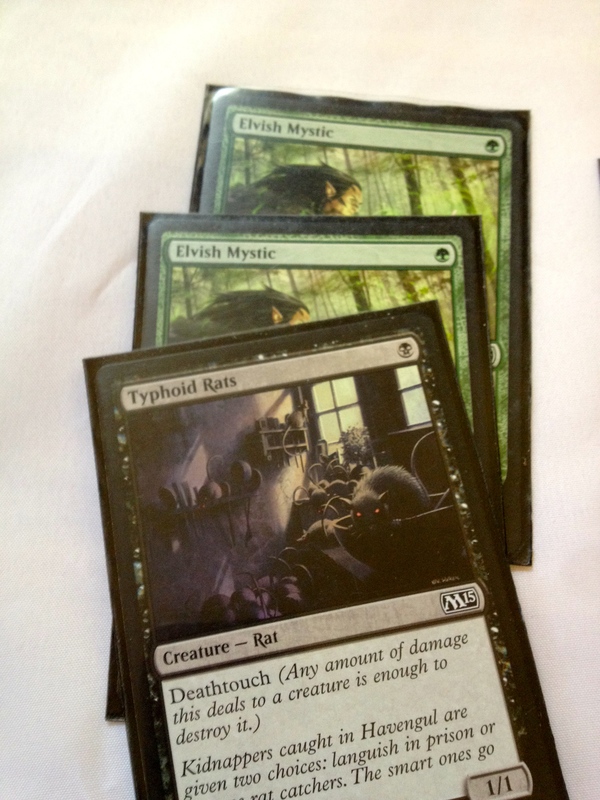 And I was able to finish off two opponents with Sign In Blood. This card was also useful in getting me cards a couple of times. Now for the boring part. LANDS. I didn’t get any pain lands. I did get two Radiant Fountain. But in the end I thought it better to just run one copy. So my deck did several things well! I may never be so lucky with a set of cards again! I went 3 and 1. The only loss for the night was against a mirror. The guy had more Sign in Blood than I had. He told me I dumped the game against him by playing cautious near the end and not swinging all out. I saw almost no one else play a planes walker, or a Soul. Wonder why I was so lucky? 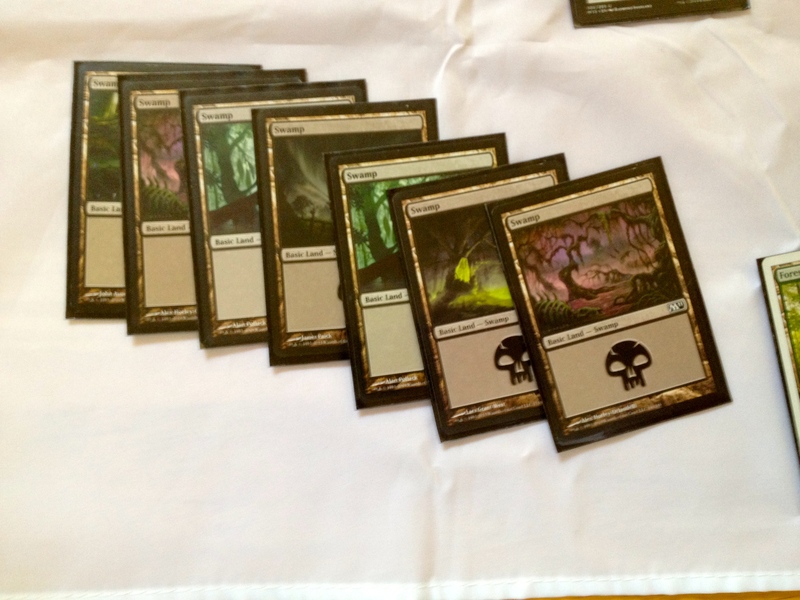 In the end, I won TEN PACKS OF M15 cards! (The top four were tied at 3-1. We all voted to split the box.) My winnings netted me an Avacyn, Guardian Angel, and a Chord of Calling, as well as a black-green pain land and a red-blue pain land. 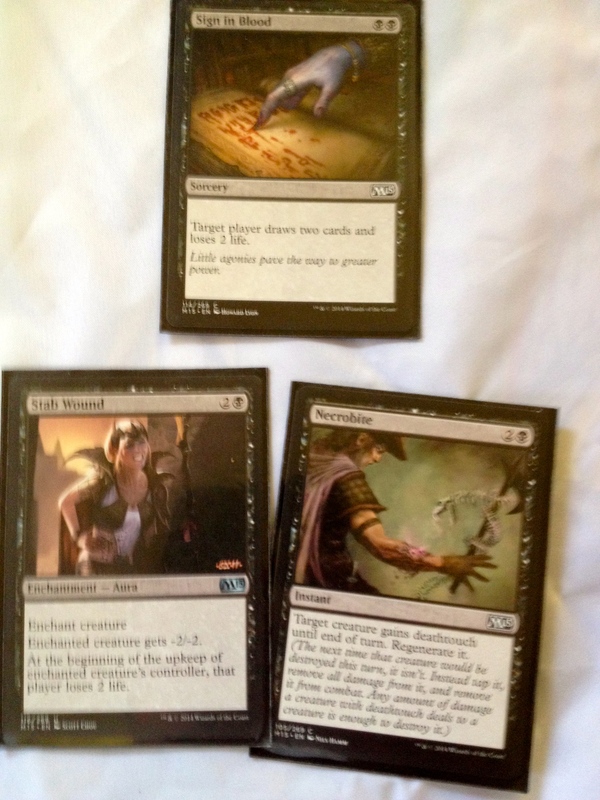 I also traded for Ob Nixilis, Unshackled, and Scuttling Doom Engine. Not bad! I even traded for a Jace, the Living Guildpact! Compared to M14, M15 is THE BOMB. The power level here is similar to what was in M13, with all those legendary creatures. The Soul cards also sort of remind you of the Titans. (M14 was a dud. It just couldn’t cut it. The slivers were lame. Red was good. Mutavault and Doom Blade were good. But other things really weren’t so good in the end. 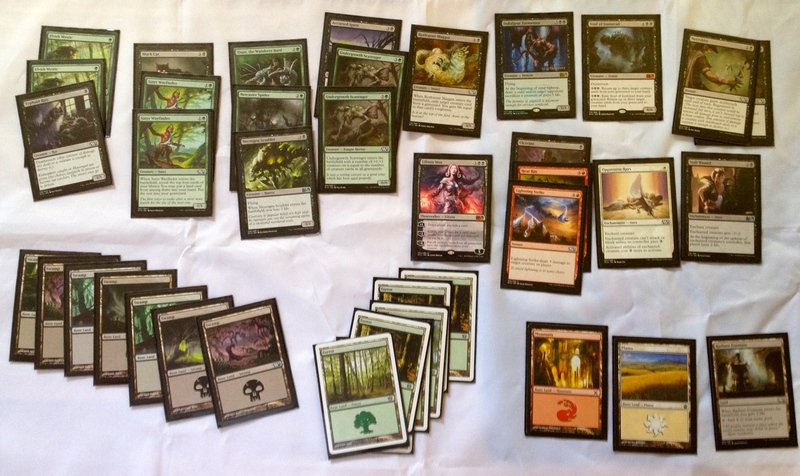 I rate M15 based on my Sealed Deck experience at 5/5. How did your experience go? Do you feel the same as me? Let me know in the comments! This entry was posted in Magic the Gathering, review, SpartanNerd, Uncategorized, Yisan the Wanderer Bard and tagged Core Set, Jace the living guild pact, Lilliana Vess, Limited, m15, Magic the Gathering, Sealed Deck, Seeded Deck, Yisan the Wanderer Bard. Bookmark the permalink.